The end of the upper arm bone (humerus) forms the ball of the shoulder joint. An irregular shallow cavity in the scapula called the glenoid cavity forms the socket for the head of the humerus to fit in. The two bones together form the glenohumeral joint, which is the main joint of the shoulder. These bones are held together by fibrous connective tissue called ligaments which are the main source of stability for the shoulder. Ligaments are not particularly flexible. Once stretched, they tend to stay stretched, and if stretched too far, they snap. Tendons are elastic, soft, connective tissue structures that attach muscles to bone. 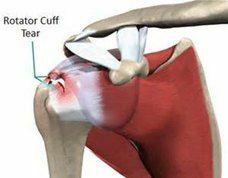 The rotator cuff tendons are a group of tendons that connect the deepest layer of muscles to the humerus. The rotator cuff muscles and tendons control our ability to raise the arm from our side (abduction). Because ligaments, tendons, and cartilage, have poor blood supply, they are slow to heal and often heal incompletely. Procedures in Regenerative Medicine, such as stem cell or PRP injections can accelerate the speed at which they heal and ensure a more complete recovery. Read more about injuries to the shoulder. For more information on treatments for shoulder conditions please visit Our Services page.